The mission of the Professional Animal Certification Council (PACCC) is to increase pet safety through the independent certification of pet care providers. In our “Part of the PACCC” series we interview some of these dedicated professionals who have successfully demonstrated their knowledge and experience to become certified. 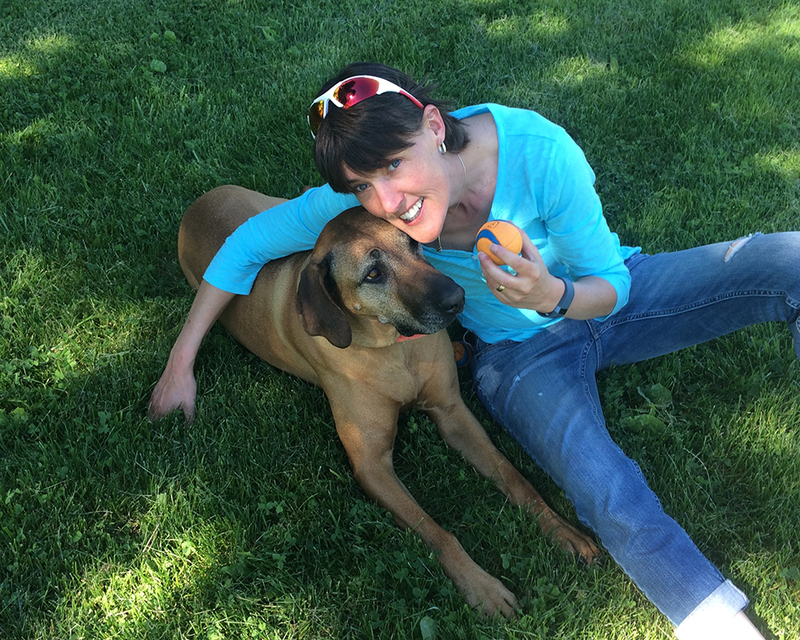 Today we meet Certified Professional Animal Care Provider Stephanie Shipley, CPACP. Stephanie is the owner of Paw & Order Inc. in Keswick Ridge, New Brunswick. Paw & Order offers boarding, daycare group training, and private training. Why was becoming certified important to you? Becoming certified as a CPACP was extremely important for me since it is the first time in our virtually unregulated industry that an independent third party can attest to the fact that we, as an organization, have the knowledge and experience to care for people’s pets in a way that is respectful, loving and kind. Completing the examination demonstrates that we don’t believe that there is such a thing as “good enough” and it shows our commitment to ongoing learning and raising the “bar” in our industry. It allows our clients to know that we sincerely care about their furry family members. I hope that others in our industry will follow suit and also become certified so that our entire community’s perspective of what they should expect in pet care can be forever changed. PACCC was founded in the U.S.A. but our pet safety mission is global. As one of our first certified professionals in Canada, why would you encourage other international pet care providers to become certified by PACCC? I would highly encourage pet care providers worldwide to increase their knowledge and become certified! Simply because PACCC was founded in the United States doesn’t mean that excellent pet care and its certification are limited by geography. Improving the lives of animals and their owners in our society is indeed a global movement and it would be fantastic to have other local area pet care service providers attain this level of certification to demonstrate to the public that pet care is a serious responsibility with credentials and certifications that require knowledge and skill. The larger the network of certified professionals, the easier it will be to refer clients to other operators locally and in other geographical areas. Such a network would also enable the sharing of best practices with other facilities and individuals who have demonstrated that they are knowledgeable and committed to doing things in a way that puts the animals above all else. What is your favorite part of being an animal care professional? My favourite part of being an animal care professional is being able to witness first-hand the successes experienced by pets and their families because of the work that we do. I love being around the animals and being able to offer love and kindness to them when their own families can’t be with them. I love to sit with them, read to them and play with them. In many cases, the training and daycamp services that we provide allow dogs to stay in their loving homes by providing education to families and exercise for dogs who might otherwise be re-homed due to high energy levels and ill-equipped families. Caring for these fur babies is a tremendous responsibility but one that provides such a significant emotional reward when you take time to simply enjoy their little personalities. I absolutely love being able to offer peace of mind to our human clients – a phrase we hear time and time again. I want our clients to be able to enjoy their time away while not having to worry about their fur babies. What is one thing you wish all pet parents knew about professional animal care? I wish that pet parents knew and understood that shopping for pet care services shouldn’t be about getting the “cheapest rate.” It should be about finding the right environment for their individual pet that will ensure both the emotional and the physical well-being of their furry family member and there are places that offer this level of care. I wish they knew that they have an obligation to be “picky” and expect nothing less than the highest standards when it comes to finding a pet care service for their pet. Until now, our industry has had no level of independent certification and the public has had no way of differentiating a qualified individual who cares for these animals with their whole heart from someone trying to make a quick buck with overcrowding and unsafe animal care practices. They should care about how their pets are being cared for when they can’t be with them. Animal care is a viable profession/career that demands skill and ongoing education. What is the most humorous or touching experience you’ve had with a pet as an animal care professional? Guinness is one of my most touching and inspirational stories here at Paw & Order. Guinness, a geriatric black Cocker Spaniel, had been an overnight guest with us on many occasions. Over the course of several years, we witnessed the slow yet ongoing deterioration of the use of his hind legs. Once a spry adult, now he couldn’t use his back legs at all and used only his front legs to pull himself along. He had so much zest for life left and wanted so badly to get up and move around – to play fetch and go for walks just like he used to do. Guinness’ mom had to travel to Europe for work and would be gone for 3 weeks and wanted Guinness to stay with us. Of course he was welcome and we started getting everything ready for his time with us as there was much to do! Immediately after his arrival we got out our measuring tape and took all the measurements needed to order a custom wheelchair for our little buddy. Timing was crucial since we had only three weeks to order, receive and train Guinness to use his new wheelchair. While we waited for the arrival of his new wheels, we would use a sling to take him outside where we would lie with him in the shade of a maple tree for hours just so he didn’t feel hopeless. The wheelchair arrived about a week later and we spent the next 2 weeks training Guinness to be comfortable in his new chair. He loved it! We would go for walks and play with the ball. Finally, he got to move around and play like when he was younger. When his Mom arrived to pick him up, we opened the front door so he could run out and greet her. Mom fell straight to her knees and sobbed with joy and her little boy ran over to her with the ball in his mouth ready to play! For the next several months, his Mom would change her schedule at work to be off earlier in the day so that she and Guinness could go to the park and play together. Sadly, Guinness passed away 4 months later but those last 4 months were filled with family, love and joy and I was so honoured just to be a part of it! If you would like to see a video of Guinness in his wheelchair while he was staying with us during this time you can check it out on YouTube. Guinness will always hold a special place in our hearts! Thank you, Stephanie, for being part of the PACCC! For more on what it takes to become certified, visit paccert.org/pet-pros.